Navajo headed for slow death? 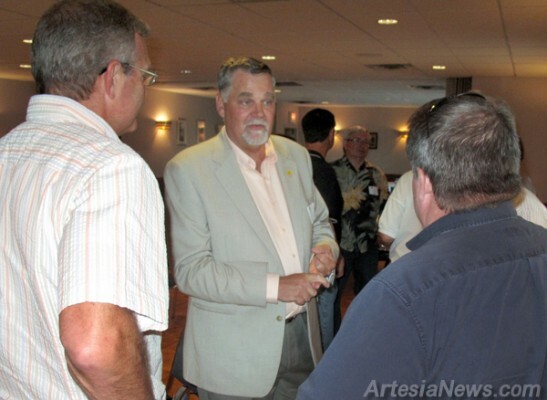 As part of an endeavor to meet his constituents, newly-hired president of the New Mexico Oil and Gas Association (NMOGA) Steve Henke visited with Artesians Tuesday from 5-7 p.m. at the Artesia Country Club. Since reporting for duty on Aug. 2, Henke has been busy combating two state administrative proposals which seek to limit greenhouse gas emissions and, in-turn, harm the oil and gas industry. He said the first measure, called the new energy economy, endeavors to cap Carbon Dioxide emissions and enact a three percent reduction each year after. The other, likely familiar to most Artesians, is the Environmental Improvement Board’s cap and trade proposal. Henke said the two are very similar in nature. “It’s largely symbolic … even the proponents will acknowledge, as a practical matter it’s not going to have any effect on total greenhouse gases or any climate change issues,” said Henke. “Proponents are touting it as leadership on the issue but those of us in affected industries are concerned about the economic expense to the state — it will cost jobs and the industry will suffer (if it’s enacted). Henke said, in the past, oil and gas contributions to the state’s general fund have been as high as 20 percent of the overall budget. “95 percent of the revenue coming off of state lands that goes to education comes from oil and gas leases,” said Henke. … For the rest of the story, subscribe in print and on the web.